Where to Buy Food Grade Paraffin Wax? 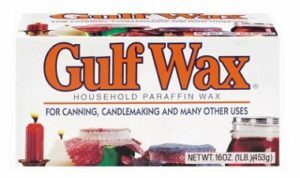 Gulf Wax, a brand of paraffin wax commonly sold in supermarkets and grocery stores for use in canning. You can sometimes buy food grade paraffin wax from your local grocery store, supermarket, or big-box store (check the aisle where the canning supplies are). Craft stores or specialty stores that sell supplies for candy making are also worth checking out. Before purchasing, always make sure the wax is food grade and intended for human consumption. You can purchase it online, in many different quantities. Many candy makers prefer buying it in bead form, since it’s easier to measure and melt. Be sure to look for product marked as “food grade” if you intend on using it in chocolate making or canning. Paraffin wax was discovered in 1830; it was found to be cleaner to burn and more reliable material for making candles than tallow. It was not commercially produced until the 1850s when wider-scale industrial techniques were designed for faster production of lubricating oil. A waste product from this process called “slack wax” is used as the base for paraffin. The “slack” is heated then mixed with a solvent. It is then distilled to remove the solvent and produces the solid known as paraffin wax. In some cases, such as if the wax is going to be used for crafting candles, odors and dyes may be added before packaging the wax for sale. According to the American Fuel and Petrochemical Manufacturers, food-grade paraffin wax differs from the industrial-grade type by being fully refined with an oil content often less than 0.5% and no more than 1.0% of its total molecular weight. Modern paraffin wax is a translucent white solid used as a chemical preservative in food. Other names for this food-grade material include canning wax, parawax, or baker’s wax. Brands common in North America include Parowax or Gulf Wax. It may be purchased in chips or solid bars of several sizes in many grocery stores in the United States and Canada. Utilizing paraffin wax in foods helps retain moisture, reduces mold growth and prevents spoiling. Added to candy and chocolate, it prevents these confections from melting at room temperature and allows them to keep their beautiful glossy shine. Rich desserts like chocolate-coated peanut butter balls and turtles would be shapeless masses of sweet goo without the addition of wax. Paraffin wax is sprayed on many varieties of fruits and vegetables largely to prevent them from rotting, but with the added benefit of making them look shiny beneath the lights in the produce section of the grocery store. Dyes may be added to the wax, especially on fruits like apples and oranges, for the same reason. Paraffin wax has been an additive in chewing gum since the mid-1850’s. Historically more common uses for the material included being made into a coating for cheeses or as a seal for jars of homemade jams and jellies. Food-grade paraffin wax is indigestible and passes right through the body without harm. It is listed as “a safe food additive” by the FDA. 1 Comment on "Paraffin Wax"
I have searched in several places in Laurel,l Md, and cannot find this wax. Does anyone know of a grocery store that carries It?